You know what’s a hard prayer to pray? This one. “Not my will but Yours be done.” After a disappointing cd10 (cycle day 10) ultrasound yesterday, I felt utterly defeated. Sometimes it can be really easy to trust when I anticipate things going according to my plans and then when they don’t, well, it gets a lot harder. But here’s what yesterday taught me – He is still in control and even when I’m upset at how much body is (or isn’t) working, He hasn’t failed me and He is still good. It can be really hard to hang in there when I can’t see the other side but isn’t that what faith is? Hebrews 11:1 is a verse I cling to often – “Faith is the confidence that what we hope for will actually happen; it gives us assurance about things we cannot see.” And so we continue to press on, acknowledging our disappointments and communicating them to Him while still believing in His power, goodness, compassion and love for us. For those who are interested in the medical talk about what’s going on, let’s just say the letrozole didn’t really do its job creating follicles. I only have a few tiny ones, most measuring about a 6-7, one 10 and that’s a stretch. My lining was a 4 and typically it has been much closer to a 9-11. My estrogen is low, hence the tiny follicles and non-existent lining. Impossible to turn around? No, but given that we only have a few days to do so, it’s not incredibly likely. The doctor wants to do one more ultrasound on Friday before canceling the cycle and we are hoping that we can still salvage this cycle. Worst case scenario is we just wait it out and possibly use Provera to induce a period if I never ovulate naturally, so given true worst case scenarios, this is nothing comparatively. Best case scenario is things look perfect on Friday and we can trigger (hCg shot) that day and have our IUI on Sunday. I don’t want to waste money on the shot, ultrasounds, blood work and IUI if things aren’t as they should be though. This is my first cycle with this new RE and we are still building trust so I am not entirely sure what to think at this point. Stay tuned. But like I was saying above, I HAVE to remember that He is in control and that even if I wasn’t expecting the news to be what it was, He wasn’t surprised. After all we have been through, I knew my heart was more guarded going into the appointment, anticipating what could be but also hopeful, as femara/letrozole has always worked on me in the past. Being prepared for disappointment and experiencing disappointment rarely is as easy as it seems. I feel a little lost as to what to expect from this cycle now. I can only lean back into the fact that God called us back into treatments, of that I am so certain, and so I can only wait for Him to provide for us in the ways He sees fit. He can still work a miracle. And if not, there’s always the next cycle. My impatience is shining through though. How much longer is this going to take? The wait is so very hard but you are so smart to have faith. Your time will come. When it does- it will be glorious! Thank you for the encouragement! SO GLORIOUS! Can’t wait for that day. :) XO! I am holding on to hope for you. As a fellow PCOS gal my body always had a late respond to these meds. Even with our ivf cycle, while the Dr was freaking out my body was just doing its usual. Thank you for the reminder that with PCOS, our bodies are just a little wack! Thanks for holding onto hope for me … it means so much! XO! I am sorry to hear this Chelsea. You are so strong in your writing and your constant reliance on God is incredible. Thank you for sharing your heart. 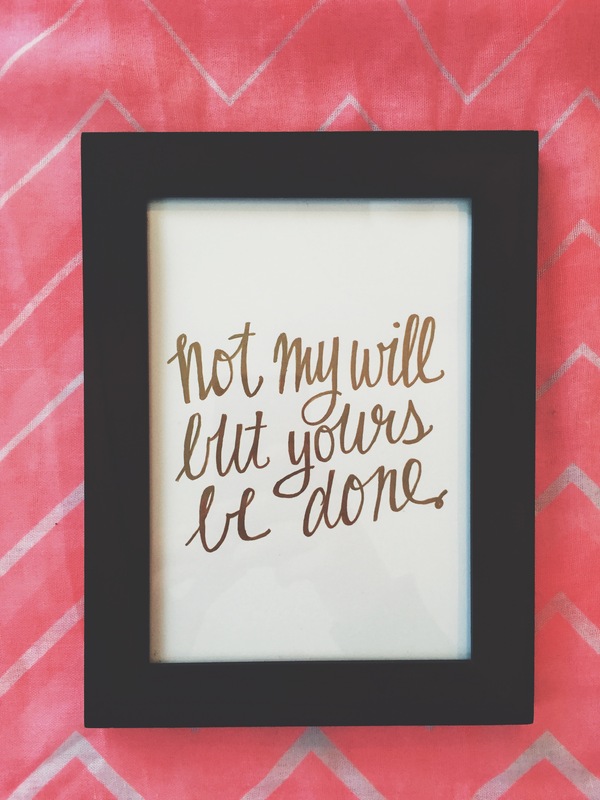 I too need to be reminded that it’s not my will but His. Thank you. Letrozole gave me a gigantic cd13 lead follicle one month, then the next (same dosage) I had super slow growth. I only tried IUIs twice with it but if I go back to IUI it’ll be with either injectables or another type of med. Have you considered injectables? They can work really well for pcos and don’t negatively impact lining like clomid or femara. Good luck sweetie, for this cycle turning itself around!! Isn’t it crazy how much they know and yet how much they don’t! it’s so out of our control and that makes it so hard sometimes! I am hoping our new doctor learns from this cycle and how I respond … I have never had lining issues with femara in the past which is why it’s so weird! Ugh! Thanks for the luck and hope! XO! “Faith is the confidence that what we hope for will actually happen; it gives us assurance about things we cannot see.” I needed to read that this morning, thank you. I am hoping hard for you that this cycle turns around right quick for you. I’ll be thinking about you on Friday! Going through fertility treatments this fall (IVF), we went through 2 rounds using Letrozole at the beginning. In one I responded pretty well (but no success in the end). In the other, practically nothing and we canceled the cycle. It was hard to swallow that even with the same medicine (even dialed up a bit), it would be so different. It was a total lesson that we are not in control at all. Only God is. And my doctor said something that encouraged me for the future. He said that in different cycles it can be like waves in the ocean. Sometimes you get big waves, sometimes you get small waves. When a batch of small waves comes, sometimes you just have to wait and bigger ones will come again. In the end, God is the only one in control and He has you in His hands. Ahhh your words are so wise and a great reminder to me today that it’s ALL in His control. We know so much and yet He is the only one who can truly create and sustain life. I love the waves analogy and will be hanging on to that reminder for many days to come. Thanks for this Godly wisdom and encouragement! Much love! I’ve found so much peace in reading your blog posts. I too am struggling to start a family and ask “how long is this going to take?” The plan is for me to start Letrozole next month, so we will see. Prayers to you! Girl! Praying God works a miracle. Praying for lots of large follicles, wisdom from the doctors, wisdom for you and Josh and of course, A BABY! Caroline, thank you so much for those prayers! They mean SO SO SO much and are heading your way as well – He is our great Healer and Life Creator! Oh Chelsea, I have been reading your blogs but have been to busy to actually comment! I am so sorry to hear the initial bad news…I am praying fervently that it there is a huge turn for the better! Grow follies grow! I know everyone’s body is so different and responds so differently. We have done 3 cycles this past year and each time I’ve had a different response to the meds- 1 follie, 2, then 4! Just know you’re not alone and are prayed for often! Jaimee! Thank you so much for your comment and for the prayers you are offering up for us. Isn’t is crazy how differently our bodies can respond? So thankful for your hopes for us and for checking in. Sending hugs and love your way! Thank you Nana for these powerful reminders of His power and goodness and love for us. You are right, I am made in His image. Thank you for taking the time to comment and continue to support us. We love you!